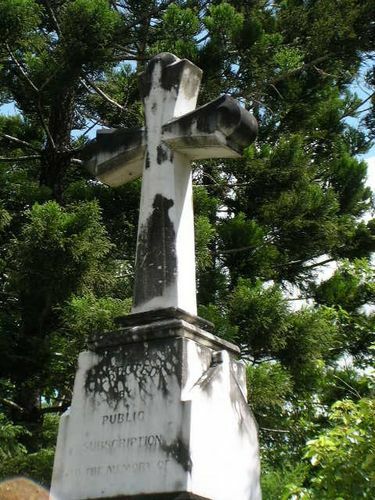 The monument over the grave commemorates volunteer fireman James Mooney who was killed by an exploding cask of spirits while fighting a fire at Hughes Grocery Store in 1877. His monument was financed by public subscription. On the day of Mooney`s funeral it was suggested that a public subscription be launched to raise a monument over Mooney`s grave. The canvassers included the grocer who owned the shop where Mooney was mortally burned and executive members of the City Volunteer Fire Brigade. Born At New York January 6th 1855 And Died March 25, 1877 From Injuries Received, While Nobly Performing His Duty As A Member Of The CITY VOLUNTEER FIRE BRIGADE At A Fire In Queen St, March 23, 1877.